It is every parent’s worst nightmare. Stephanie Harker is travelling through the security gates at O’Hare airport when she is taken into a perspex box having set off the metal detectors. Made to wait outside, five-year-old Jimmy is led away, by hand, by a uniformed officer. Stephanie’s panic and shouts lead security to believe she is a threat, and she is tasered brutally to the ground amidst her screams of protest while Jimmy disappears into the distance unnoticed by anyone but her. However, when Stephanie has a chance to tell her story to the FBI, it becomes clear that everything is not as it seems. Unanswered questions surround Jimmy’s background and why someone would want to abduct him. But it is Stephanie’s close friendship with reality TV star Scarlett Higgins that appears to lie at the bottom of a tale of death, deception and the extraordinary lengths to which a parent will go to protect their child. 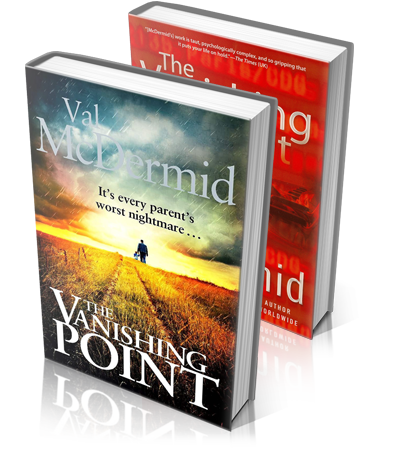 Kobo in conversation: Author Val McDermid talks with author and journalist Paula Todd about her latest novel The Vanishing Point; plus publicity, celebrity and the future of books. In this intelligent and hypnotically readable thriller, what really interests McDermid, and us, is the meaning of fame and how people deal with being famous. The relationship between Scarlett and Stephanie is one of the best things she has done. True, the double narrative is sometimes cumbersome and a large red herring stinks to high heaven; but these add up to a small price to pay for this entertaining and thought-provoking book. Roll on next autumn. McDermid’s latest novel begins with British ghostwriter Stephanie Harker and her five-year-old charge, Jimmy, queuing for a pat-down at the airport in Chicago. It turns into a nightmare when the boy is led away, and Harker finds herself on the wrong side of the barrier, powerless to intervene. By the time she’s convinced the security guards that Jimmy has been abducted, the boy is long gone. Having racheted up the tension, McDermid changes down a gear for a lengthy chunk of backstory. It’s a risk that pays off, as the subject is one of perennial fascination – celebrity culture and the cynical manipulation that surrounds it. Recruited to write the autobiography of Scarlett Higgins, who found fame on a reality TV show, Harker finds herself becoming unexpectedly close to her subject. Her recollections are interspersed with faster-paced accounts of the attempts of the police on both sides of the pond to find Jimmy. Both strands are masterfully handled, and McDermid’s ability to wrong-foot the reader remains second to none: highly recommended. McDermid keeps tension high with red herrings and plot twists. The sheer brio of her writing produces that increasingly rare thing, a genuine page-turner that doesn’t insult its readers’ intelligence.